Fans sock it to the NFL: Football fans are benching America's favorite fall pastime to protest domestic violence cases haunting the NFL. Even after the league enacted tougher punishments and three accused players sat out yesterday's games, the Twitter hashtag #BoycottNFL ran rampant with demands that Commissioner Roger Goodell leave. The women's rights group Ultraviolet flew a prop plane aerial banner over the New York Giants-Arizona Cardinals game Sunday, saying "#GOODELLMUSTGO." To run or not to run: That was the question put to Hillary Clinton yesterday, while she fried up some steaks in Iowa. The answer? None, really. With Bill Clinton at her side, she told about 200 journalists that they were in Indianola to help Democrats at the annual outdoor fundraiser called the Harkin Steak Fry. Sen. Tom Harkin has held it 37 times. Yesterday was his last. Clinton leads in the polls, but she lost her primary bid in the state in 2008, so some down-home face time in Iowa may have done her some good. New beheading threat: ISIS says it’ll do it again. Over the weekend, the Islamist extremists posted video of the beheading of a British aid worker. That was a message to America’s allies, they said, and they have another hostage from the UK who could also meet with a barbaric fate. Their threats seem not to deter - but instead to spur - President Obama's military plans. He says he'll expand airstrikes against ISIS into Syria and is asking other nations to help out in the fight. They meet today in Paris to discuss how to go about it. War and peace: There are good signs and not so good ones coming from Ukraine. Pro-Russian rebels released captive Ukrainian troops yesterday as part of a ceasefire deal. But even with the truce, shells fell all day. Today, "Exercise Rapid Trident" kicks off. It will put American boots on the ground in Vladimir Putin's backyard in Ukraine - but in the west, away from the conflict. It's a training exercise, and it's happened before, but not since the start of the Ukraine crisis. Hard labor: For months, he was held captive by the North Korean regime, not even sure what he would be charged with. 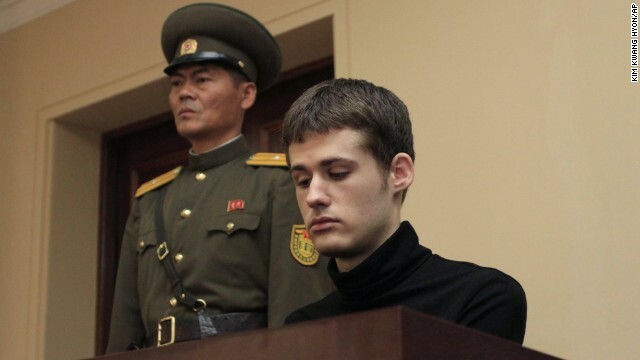 Then in one fell swoop, American citizen Matthew Todd Miller was convicted of committing "acts hostile" to North Korea and sentenced to six years of hard labor. What did he do to deserve that? State media said that when the 24-year-old arrived as a tourist in April, he ripped up his tourist visa and shouted his desire to seek asylum there. - Big hole in your pocket: Golfer Rory McIlroy teed off for a hole-in-one. But not into the cup. The ball landed in the pants pocket of a fan along the fairway. - Who's your daddy? It's a guy with a beard, this little girl knows. So, when he shaves it and unveils his smooth skin to her, she throws a fit. - The bottom drops out: That must be what it feels like for this 29-year-old man who takes his first flight and is overcome with aerophobic fright. - Dog's best friend: You just can't help but see that animals have feelings, too, when you watch this puppy reunite with his rescuer. Too many boys are not becoming men because their parents refuse to teach them how to be a man. Violence begets violence; however, and no doubt the message they are learning is that violence is acceptable. Stop calling ISIS terrorists - they are murderers - a gang of monsters committing murder for their own gain. If you decide to go to NK and end up in trouble it's your own stupid fault - you can't fix stupid so don't expect us to come to your rescue. Seriously? Why in the world are people getting so worked up about a father disciplining his child? It's the same people whose children are throwing tantrums in the grocery store and screaming until they get what they want. Do you think those children are going to simply grow out of it? No! That's why you discipline them. The kid's wounds will heal, and he'll be more respectful after. He'll think twice about doing something dodgy. IT'S PARENTING. It's been that way forever. Stop getting overworked up about things that don't pertain to you. Daddy's little girl's reaction to his beardless face-PRICELESS and TOUCHING!!!!!!!! Puppy and rescuer reunion HEARTFELT!!!!!!!! Will someone see if my comments on Friday, September12,2014 are still awaiting moderation. Thank you. Parents should have the authority to raise their children in a way that they believe will produce values that they hold. Mr Cuomo's comment that spanking does not produce change can be said for the prison system as well. Should we release all prisoners and let them go to their rooms? The idea that emotional punishment is better than physical punishment is widely pushed by a group of people because it plays to their lifestyle. I wonder who were the participants of the studies that were done. I disagree with time out because it produces physically intact but emotionally damaged people who find it had to stay in relationships hence high levels of divorce, broken families and so on. As someone who had an abusive mother, it is all too easy to say spare the rod and spoil the child - if you do not spare the rod, you end up with children who may need therapy or who will repeat the pattern of violence. Emotional/psychological abuse is also damaging. A very high percentage of people who are incarcerated were victims of physical and/or sexual abuse. Also, a Harvard researcher discovered that children who are abused experience physiological changes to their brains that can become permanent.